The process begins by gaining a thorough knowledge and understanding of the client and their needs. It continues with ongoing client communication and collaboration to ensure expectations are fulfilled. As a result, the project will engage the viewer with it’s message, realize goals and objectives, incorporate sustainable practices and inspire audiences to take action. My commitment to every job exemplifies the highest quality of work by providing exceptional and personalized service from concept through to completion. 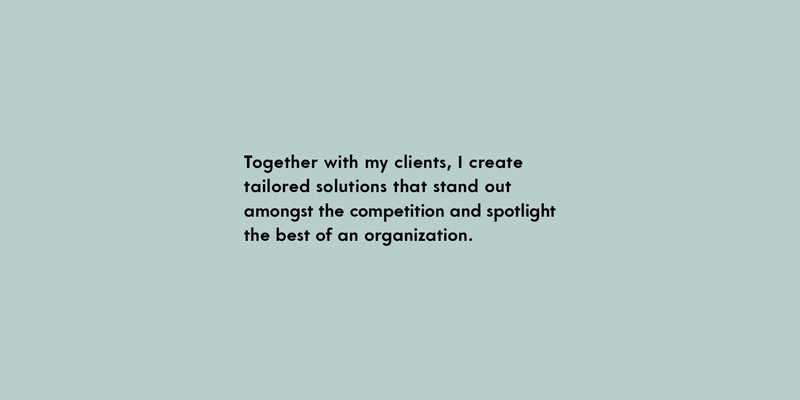 Ten years of professional experience has allowed me to develop successful continued relationships with a diverse client base from small not-for-profits to large institutions. As part of my services, I guarantee promptness, reliability and seamless communication regardless of distance. This is evident in my primary client base, currently in Saskatoon, Calgary and Toronto, with my studio located in Lumsden, Saskatchewan. My commitment to every job exemplifies the highest quality of work by providing exceptional and personalized service from concept through to completion. I worked with Danielle when I was Manager of Communications and Marketing for the MacKenzie Art Gallery. We contracted her to lead a number of print design projects. She is very creative and came up with great solutions that spoke to our target audience, while respecting our budget. She was always a pleasure to work with and worked very hard to ensure client satisfaction.